67/92 David Mumpower You probably thought it couldn't get any worse than 2 Fast 2 Furious. You were wrong. 114/126 Kim Hollis It's amusing in an MST3K kind of way, but that's all. Torque draws frequent comparisons to The Fast and the Furious, and probably for good reason. It’s an action movie that involves a lot of racing - only this time it’s motorcycles instead of tricked-out cars. The plot revolves around Cary Ford (The Ring’s Martin Henderson), a lifelong biker who is framed for murder by a rival named Henry (Matt Schulze, fresh off the bad guy role in The Transporter). Henry is in charge of a biker gang called the Hellions, and the murder victim in question happens to be Sleepy D, the brother of Trey Wallace (Ice Cube). 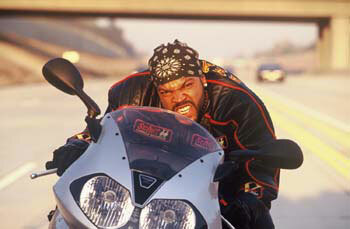 Wallace fronts a motorcycle gang known as The Machine, an infamous group that is feared across the country. Caught up in the circumstances, Cary and his friends are forced to go on the run as they have both Trey’s gang and the FBI hot on their trail. Jaime Pressly plays Henry’s girlfriend. The film marks the feature film debut of prolific music video director Joseph Kahn, who is well-respected for his fine work on videos such as Eminem’s Without Me and Moby’s We Are All Made of Stars (attention, irony police!). With his involvement, Torque should be a stylish affair with plenty of action.